Leave the A30 at Bodmin. Follow the signs for St Austell on the A38 by taking the first left at Carminnow Cross Roundabout. Leave the A38 by taking the 3rd junction off the Turfdown Roundabout on to Turfdown Road and the B3268. Follow the sign for Fowey and the B3268 by turning left at the next mini-roundabout. This then becomes the B3269 at Sweetshouse. Briefly turn right on to the A390 and after 1/2 a mile, look out for the sign to Fowey and the B3269 on the left. 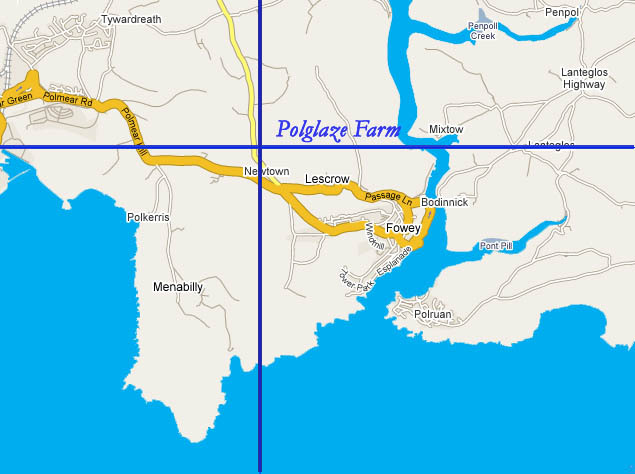 Follow the B3269 towards Fowey and you shall find Polglaze on the left as you approach Fowey. From the Four-Turnings (Texaco Garage) mini-roundabout on the outskirts of Fowey, take the B3269 towards Lostwithiel and you will find Polglaze Farm is signed about quarter of the mile on the right side. Alternatively Par Railway Station is a 10 minute bus or taxi ride from Fowey. Newquay Airport is approx 20 miles from Fowey and accessibly by Taxi or Private car hire.